Disclosure-No compensation was received. Informational post only. Any opinions expressed are my own. Linda Campbell (right), 69, wanted a convenient and easy way to lose weight before taking a family cruise to Alaska and decided to join Jenny Craig. After seeing the success of her mother losing 9 lbs. 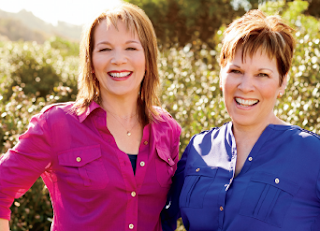 * on the program in one month, Pam Campbell (left), 48, decided to join Jenny Craig herself and the two women began supporting each other’s goals and sharing their successes. Two years ago, Linda lost her husband to a heart attack, and it deeply affected her daughter Pam as well. After suffering this loss, it became even more important for Linda to take the necessary steps to reduce her own risk of heart disease. The women met with their Jenny Craig consultant weekly and learned portion control and how to make more meals on their own. “It’s a very flexible program. You learn how to eat out, cook on your own, what to do for emotional eating…I loved my consultant,” says Pam. After losing 22 lbs. * on the program, Linda’s BMI is now in a healthy weight range and she was able to lower her blood pressure. Pam lost 35 lbs. * and the experience of losing weight and adopting a healthier lifestyle with her mother really brought the pair closer together. Both Linda and Pam walked on a regular basis, among other activities, as part of their weight loss journey with Jenny. Studies have shown that three, 10 minute increments of walking, or a 30-minute session, can contribute to managing a healthier weight. As part of its 30th birthday celebration, Jenny Craig is encouraging Americans to commit to walking 30 minutes a day. For free walking plans, visit jennycraig.com. Are you inspired to make a change? In honor of Mother’s Day, share your “Ah Moment” to getting healthy and enter for a chance to win! You could win a trip for two to NYC to attend Jenny’s 30th birthday party, a free Jenny program, 30-days of Jenny food, a tour of the O Magazine offices and a night on the town complete with dinner and a Broadway show! Visit www.omagonline.com/jenny for more information on how to enter. Plus, share your inspired “Ah Moment” on your Twitter page using #Jenny and be entered to win one of 100 Jenny prize packages! For more information on Jenny Craig, visit: http://www.jennycraig.com/. Don’t forget to visit http://www.jennycraig.com/heart-walk to learn about how Jenny is supporting the American Heart Association’s My Heart. My Life.™ initiative. Here, you will be able to sign up for the American Heart Association's Heart Walks taking place in over 300 cities through 2013. What a great, inspiring story about Linda! I'm close to her age and it shows that it's possible to reach your goal with hardwork.